The lack of lithium in older stars is a long-standing puzzle. Lithium has now been found for the first time in material ejected by a nova. 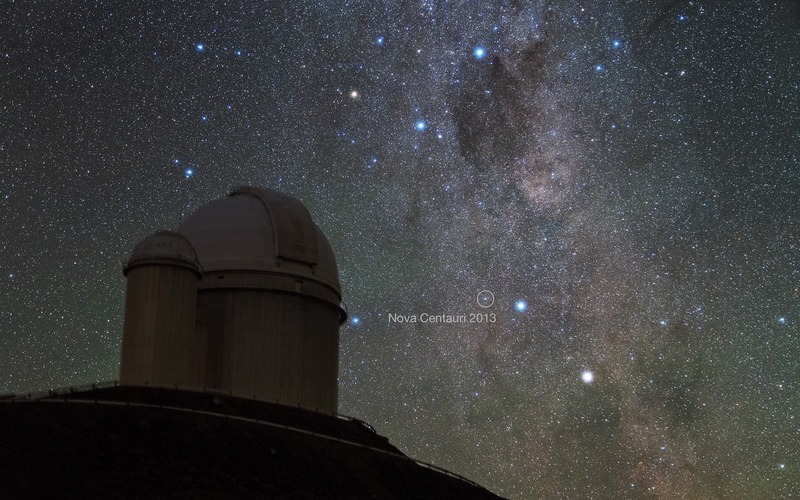 Observations of Nova Centauri 2013 made using telescopes at ESO's La Silla Observatory, and near Santiago in Chile, help to explain the mystery of why many young stars seem to have more of this chemical element than expected. This finding fills in a missing piece in the puzzle representing our galaxy's chemical evolution, and is a big step forward for astronomers trying to understand the amounts of different chemical elements in stars in the Milky Way. The light chemical element lithium is one of the few elements that is predicted to have been created by the Big Bang, 13.8 billion years ago. But understanding the amounts of lithium observed in stars around us today in the Universe has given astronomers headaches. Older stars have less lithium than expected, and some younger ones up to ten times more. More precisely, the terms "younger" and "older" are used to refer to what astronomers call Population I and Population II stars. The Population I category includes the Sun; these stars are rich in heavier chemical elements and form the disc of the Milky Way. Population II stars are older, with a low heavy-element content, and are found in the Milky Way Bulge and Halo, and globular star clusters. Stars in the "younger" Population I class can still be several billion years old! Since the 1970s, astronomers have speculated that much of the extra lithium found in young stars may have come from novae – stellar explosions that expel material into the space between the stars, where it contributes to the material that builds the next stellar generation. But careful study of several novae has yielded no clear result up to now. A team led by Luca Izzo (Sapienza University of Rome, and ICRANet, Pescara, Italy) has now used the FEROS instrument on the MPG/ESO 2.2-metre telescope at the La Silla Observatory, as well the PUCHEROS spectrograph on the ESO 0.5-metre telescope at the Observatory of the Pontificia Universidad Catolica de Chile in Santa Martina near Santiago, to study the nova Nova Centauri 2013 (V1369 Centauri). This star exploded in the southern skies close to the bright star Beta Centauri in December 2013 and was the brightest nova so far this century – easily visible to the naked eye. The very detailed new data revealed the clear signature of lithium being expelled at two million kilometres per hour from the nova. This is the first detection of the element ejected from a nova system to date. This high velocity, from the nova towards the Earth, means that the wavelength of the line in the absorption in the spectrum due to the presence of lithium is significantly shifted towards the blue end of the spectrum. Co-author Massimo Della Valle (INAF-Osservatorio Astronomico di Capodimonte, Naples, and ICRANet, Pescara, Italy) explains the significance of this finding: "It is a very important step forward. If we imagine the history of the chemical evolution of the Milky Way as a big jigsaw, then lithium from novae was one of the most important and puzzling missing pieces. In addition, any model of the Big Bang can be questioned until the lithium conundrum is understood." "It is very exciting," says Luca Izzo, "to find something that was predicted before I was born and then first observed on my birthday in 2013!"